Natural Units is a specialized unit converter for iPhone and iPod touch that lets you quickly convert between distance, time, mass, energy, and temperature. Enter a value in one unit and instantly see the values of the other four converted units. You can even load values from a set of commonly used constants or add your own. 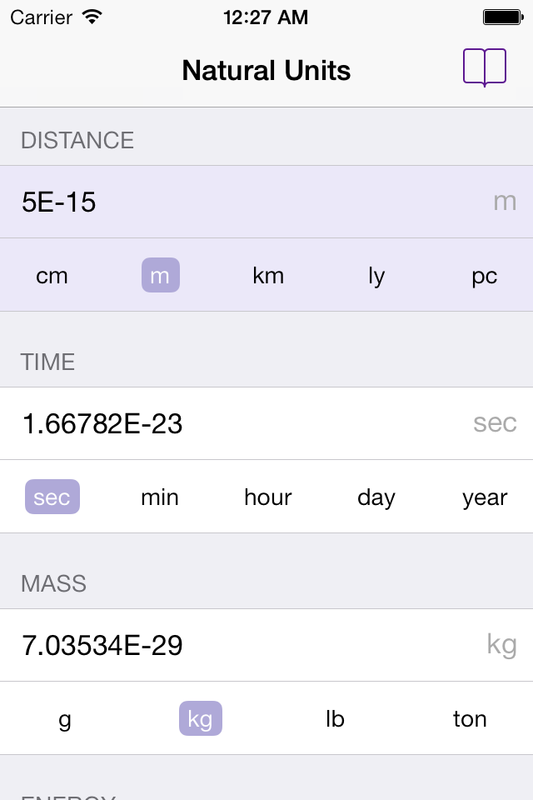 Natural Units is a free download from the App Store. Note: Distance and time are inversely related to mass, energy, and temperature, so understand that Natural Units displays the inverse value when converting between these sets of units. For example, if you enter a value X in cm and Natural Units displays a result Y in Joules, the actual converted value would be 1/(Y Joules).